Since starting the Beamish Owners Club in 2004, it had been my ambition to meet the man who started it all off. Finally I managed to make contact with him through his sons via their motocross track website. So, on a wet and wintry afternoon in February 2006, I met Graham Beamish for lunch, a beer and a chin wag! Graham lost the sight in his left eye at the age of 21 while he was still a works motocross rider for BSA – we both mused that this sport used to be called scrambles! Four years ago, Graham went into hospital for a routine operation supposed to be a couple of days. He contracted the MRSA bug in hospital and had a stay of five months. He has been left almost completely blind and no longer able to have the support of a pacemaker to regulate his heartbeat. I had hoped to learn all the secrets and information that has eluded me about the Beamish since I started researching the bike but alas not! I learned many things from our meeting and these are written here but where the company records of frame numbers and what happened to the mudguards moulds will remain a mystery! Graham was bemused and fascinated to hear that there is still such interest in the bikes he made. He doesn’t have a computer let alone the Internet so had never heard of the Beamish Owners Club. He has been used to rubbing shoulders with top echelons of Suzuki and operated on an entirely different level from the likes of me and you. Where we have made a trip to the Suzuki dealer for parts, or a new bike; Graham had been invited to Japan to talk about deals involving thousands of Suzukis at a time! He made no bones about it, his heart was in motocross rather than trials. Although he has ridden trials with some success it was the motocross world that he enjoyed best. In the early 70’s Graham had a thriving local motorcycle business selling motocross bikes. At the time Suzuki were producing the TM range, which had a reasonable 100 and 125, but the 250 and 400 were neither competitive nor reliable. Graham’s eldest son, an up and coming young rider, was having notable success on the TM100. At the time Suzuki were looking for someone to take charge of their off road bike sales in the UK. Graham was quick to spot the opportunity and had the vision to offer Suzuki his company as importer and a dealer network for sales – just what they were looking for. Having his foot in the door of Suzuki, Graham was able to influence the development of their motocross range. Having explained the shortcomings of the TM model, Graham helped develop the ‘Real Motocross’ or RM range now legendary. At a similar point in time, Gordon Farley, one of Suzuki's works riders, was helping Japan develop a serious trials bike – the Exacta RL250. Not for the last time, Suzuki made a marketing mistake and produced 4,000 Exacta RL250’s for the US market. Unfortunately, the Americans weren’t into trials, they were into ‘dirt bike’ (motocross) and ‘sand racing’. The poor old Exacta arrived without a market place for fill and sat in the US showrooms. In the UK the bike proved competent in the mud but struggled in the north of the country over the rocky terrain. Graham had a few of the RL250’s and started making modifications to try and improve the bike. This is where Brian Fowler came in. Brian had been a competent motocross rider and an excellent trials rider himself. Brian also knew how to prepare a bike. At the time, Brian was working for the Electricity Board full time and selling the odd bike to friends on the side. Brian had a few ideas of his own about how to improve the Suzuki trials bike. Suzuki were interested to learn that Graham was beginning to sell his modified Suzuki as the US sales were still pityful. Suzuki made Graham an offer he couldn’t refuse and around 3,000 Suzuki Exacta RL250’s started being shipped from the States to Graham’s family farm in Sussex. He knew that it was going to take more than a few minor modifications to make the Suzuki trials bike popular. Working with Mick Whitlock to produce a better frame and Brian Fowler to develop and built the new bike on the Whitlock frame, the ‘Beamish Suzuki’ was born in 1975. One question that I have often been asked is what colour is Beamish yellow? Beamish yellow is in fact Suzuki yellow as on the RM models. Ther red/black was not anything to do with Heron Suzuki, it was more likely a whim of Brian Fowler’s towards the end of the silver engine model. Mudguards for the black engine model were made at the factory as wer side panels. Nick Beamish 17 years younger also did development work. At the peak, Mick Whitlock was producing 5 frames a day. In the early 80’s Heron Suzuki, who had the concession for all Suzuki road bikes in the UK, made a move to obtain the off road concession as well. Heron obviously had much higher sales and much more persuasive power than Beamish; so the off road moved to Heron Suzuki in Croydon. No bikes were ever produced there and Graham retired to Spain. Thus marking the end of the Beamish Suzuki. Suzuki kept Graham busy by flying him to all motocross Grand Prix all over the world to be their eyes and ears. So it was a squeeze out rather than a sell out that heralded the end of one of the best twinshock bikes ever produced. 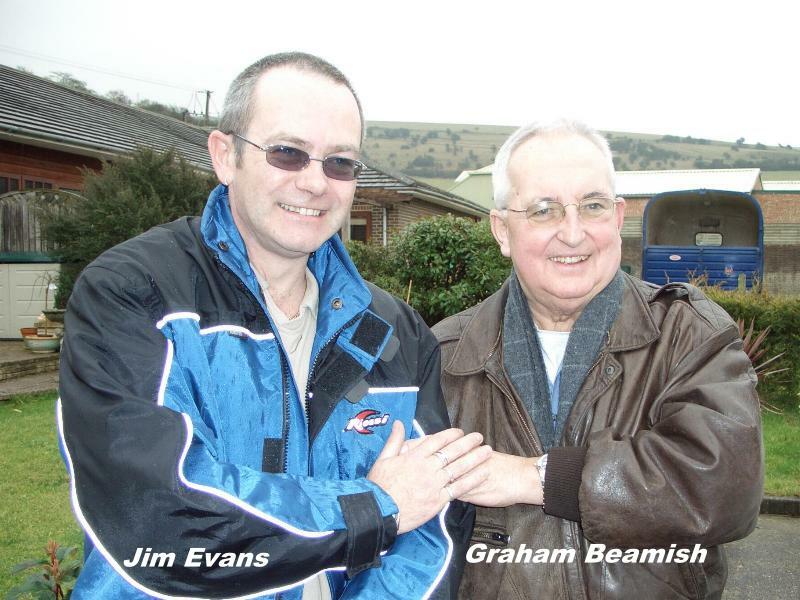 Graham Beamish (right) and Jim Evans (left).